Effective immediately, my blog is now hosted on garyditto.com using Wordpress. All previous blog entries have been imported into the new blog and can be searched and accessed through the archived folders. Please continue to send community news and other announcements to me via email (gd@garyditto.com). Once again, the Town of Kensington, in cooperation with Bethesda Help, will be conducting a Food Drive on Saturday, October 24 between the hours of 9:00 am – 12:00 noon at Town Hall, as part of Montgomery County’s Community Service Day. IMPORTANT: Bethesda Help is unable to use food items that come in glass containers or in oversized bottles, cans, and packages. Bethesda Help is always looking for additional volunteers to help out with food delivery. More information can be found at http://www.bethesdahelp.org/ or by calling 301.365.2022. The Town’s Annual Picnic that was scheduled for Sunday, October 18 has been postponed due to weather. The Town is considering all options, including rescheduling and canceling until the spring. We will let you know through list serve and website announcements as soon as a decision has been made. Note: Please disregard the Around Town Journal’s information regarding the Town Picnic. The Journal should be delivered by Tuesday afternoon. The youth of Warner Memorial Presbyterian Church in Kensington are collecting gently used children's and young adult books to sell at a used book fair. All proceeds from the fair will be used to purchase new books for children at the Crossway Community in Wheaton. The Crossway Community is a unique educational and residential program for families. It offers supportive housing for at-risk mothers and their children, a community training institute for job and career growth, a Montessori based Community Day School, and the Community Center which hosts programs on all subjects of interest to the greater community. The Used Book Fair will be held from 10 AM to 2 PM on October 24 in the Social Hall of Warner Memorial Presbyterian Church. Used books can be dropped off at the Warner Church office, 10123 Connecticut Avenue, Kensington, through Thursday, October 22. 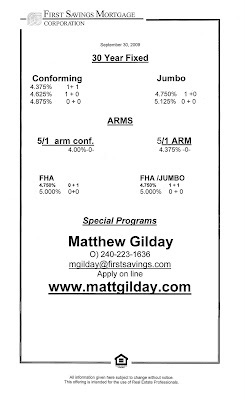 Call Jan Moody at 301-949-2900, ext 307 with any questions. The Press Contact for this event is Jan Moody, 301-949-2900, ext. 307 or dcewarner@comcast.net. Serving members in Aspen Hill, Bethesda, Brookeville, Burtonsville, Chevy Chase, Colesville, Garrett Park, Hyattsville, Kensington, Olney, Potomac, Rockville, Silver Spring & Wheaton for 116 years. Congratulations to the Town of Kensington and our neighbor to the south, Chevy Chase View on successfully obtaining $100K in grant funding for pedestrian safety! The grant comes from the Safe Routes to Schools program which is federally funded and administered by each State. This is a great example of local, state and federal governments working together to improve our quality of life and make our neighborhoods safer for kids. Kudos to Mayor Fosselman for collaborating with our neighboring jurisdiction to pursue this grant. Former Town employee Claudia Donnelly was instrumental in putting together the grant application. This is a first for Kensington. Please join for some harvest fun.... we will have a small pumpkin patch, music, fun and games for the whole family. We ask that you bring pot luck snack for apprx. 8 people. The town will supply water,soda,lemonade,cider and beer and a ton of apples from Hawkins market!!!! The Kensington VFD will be around to give tours of some of the fire engines!! "In the Eye of the Appraiser"
"Red to Blue:Congressman Chris Van Hollen and Grassroots Politics"
Sanford Gottlieb worked in the peace movement from 1960 to 1993. He was executive director of SANE. The author of Defense Addiction, in 2002 he served as a Kensington precinct coordinator in Van Hollen's campaign. The James Renwick Alliance is pleased to announce our sponsorship of the second annual “JRA Day” featuring exceptional and unique crafts by over 40 member artists for sale to the public. The event, for one day only, will be held in the gracious halls of the Women’s Club of Chevy Chase conveniently located on Connecticut Avenue and includes free parking to our patrons. Craft lovers will have the opportunity to meet this talented group of craft artisans and learn about their artistic principals and technical expertise. The artists represented are members of the JRA and this fundraiser will contribute to its many programs. The James Renwick Alliance is an independent, national, non-profit organization that celebrates the achievements of America’s craft artists and fosters scholarship, education and public appreciation of craft art. Admission is $5 for members and $7 for non-members and free to those who join the James Renwick Alliance that day. Welcome to this charming four bedroom, three full bath brick Cape Cod located in prestigious Locust Hill Estates. Centrally located, this beautiful home is ideal as you can walk to the Stoneridge School, NIH, Navy Medical and the Metro. 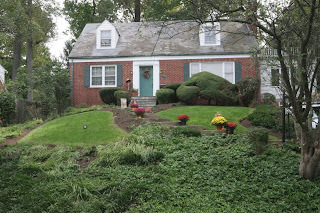 You are also only steps away from Rock Creek Park! Among its many features, please take note of the wonderful first floor family room that opens out to the private flagstone patio. Also, enjoy the beautifully landscaped private back yard and gardens throughout all the seasons. Other features include a breakfast room off the kitchen (also perfect for a den or study), a one car garage, a sun-filled and cozy living room with fireplace, as well as a large lower level recreation room. It’s time to “FALL” in love. Come share your views and hear the latest from your District 18 General Assembly Members State Senator Richard Madaleno, and State Delegates Alfred Carr, Ana Sol Gutiérrez, and Jeff Waldstreicher. The new Maryland state legislative session is fast approaching. There will be tough decisions to be made. Meet the elected officials who will influence the budget and help set priorities. Ask questions about educations, transportation, health care issues, etc. and let them know what's important to you. Long & Foster teams up with Google for an easy 'Real Estate Quick Search Widget"
Staying on the cutting-edge of technological innovation has been a driving goal since the creation of Long & Foster Real Estate, Inc. Time and again, it has achieved this goal, whether by offering technology certification courses and web-based training to its agents or by creating dynamic agent websites and regularly updating its comprehensive public website. The Real Estate Quick Search widget for the Google application iGoogle is just one more way Long & Foster is staying abreast of the latest technological trends. 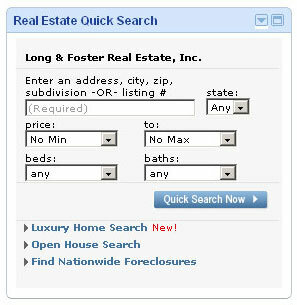 "Buyers, sellers, enthusiasts and real estate agents will find this tool simple to use and completely versatile," said Michael Koval, Senior Vice President and Chief Information Officer for Long & Foster Real Estate, Inc. "You can search based on location, price range, number of bedrooms, number of baths, or any combination of those criteria." How does it all work? It starts with iGoogle. iGoogle is a personalized homepage available to Google users. It is completely customizable, so that when you log on to the Internet, everything you want to know – from the weather and news to t.v. listing and movie showtimes – is right at your fingertips. Like these widgets, Long & Foster’s new Real Estate Quick Search widget can be downloaded to your iGoogle homepage, allowing you to conduct a simple search for homes for sale or comparable properties in your neighborhood. Once your search is complete, you can click on the desired property to be taken to www.longandfoster.com for full listing details. Explains Koval, "The best part is you can see the listing information without leaving your iGoogle page, but if you do want to see more details on the property then you can go directly to the full listing on our full www.longandfoster.com website." In short, the Real Estate Quick Search widget is designed to save you time while still keeping you informed about up-to-the-minute market developments. With a little help from iGoogle, Long & Foster is doing just that.